Today is the day the nation sets aside to honor Dr. Martin Luther King, Jr.
Well, most of the nation, anyway. For some it’s like other holidays – simply a day off. And lately I’ve noticed stores advertising MLK sales. Some would like this to be a day of service, an opportunity to give back to the community, which I think is a fine idea. Anything that encourages civic engagement is. Some students, though, are not off today. Washington & Lee is holding classes today. The reason is that the school has founders’ day later this week, but the university doesn’t close for Labor Day or Veterans’ Day, either. W&L isn’t alone: VMI is also holding classes. While I appreciate that there is a holiday honoring Dr. King, in some ways it has become just another holiday. And that’s sad. Because the lessons of his life and the legacy which he left are still pertinent. I’m old enough to remember a bit of King – especially his death – and the impact he had on our country. His words, some of which grace my favorite quotes page, remain an inspiration. A couple of earlier posts of mine you might be interested in are here and here. As a W&L alum, it doesn’t bother me that we had class on MLK Day. I never saw it as a slight to MLK, nor do I see private offices who chose to be open today as a slight to MLK. Like you said in your post, many people today just see it as “another day off.” So while I would be fully supportive of W&L (or any other university or employer) instituting a day of service in lieu of class/work, I can guarantee that if it were just a day with no classes, students would just see it as an opportunity to party the night before, sleep in, put off studying, etc. etc. And in my mind, being in class & educating oneself is far more in furtherance of MLK’s ideals than having an excuse to party & sleep in. The world would be a better place if people were judged by the content of their character. That our own government divides us by race and “ethnicity” in the census, in EEOC filings, and in a racial spoils system is truly disgusting. From what I hear, Martin Luther King was Republican, and subscribed to our principles. How do all of the Democrats oN here think about that? I think that trying to ascribe one position or another to a man long dead is futile and counterproductive. Yes, his niece says he would be a pro-life social conservative, but she cannot know that. Were he still alive, his opinions may have changed, and he might have become one who thought that corrective racial preferences were the way to go. He may have come to think that, as the data show, the main driver of Black poverty and crime is unwed motherhood, and the way to reduce unwed motherhood was by killing the babies in the womb. At some point, I’m going to write an article about the how the Republicans and Democrats essentially flipped what they stood for. I just have a lot of research to do, because I want to pinpoint the time frame. One thing I will say: to compare a Republican pre-Civil Rights era with a Republican today (or a pre-Civil Rights era Democrat to one today) would be to ignore this fundamental shift in party philosophy. Some perspective from lowcountry South Carolina, where I marched in two memorial parades yesterday: We marched right past the Squat’n’Gobble where Rick Perry notably engaged the restaurant’s prop mannequin just last week in front of national media who were not present yesterday. That march was a true memorial in a town that claims a Secession Oak and many Gullah descendants. It was preceded by a decidedly homegrown program of readings and other artistic interpretations performed by mostly young people before a packed Town Hall. The morning’s march was more sedate in a town also populated by descendants of slaves and was also more diverse in its marchers. Memorial events in both towns included service projects and shared meals. Although there are those in our community who have never embraced the contributions of the Rev. 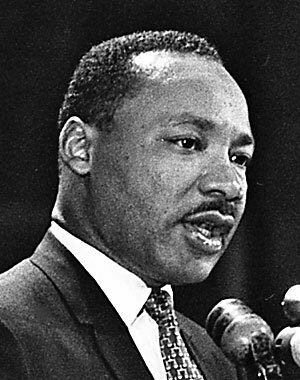 Dr. Martin Luther King, Jr., many DO care about what he lived and died for. For me, it was meaningful to be around the latter and to keep remembering Dr King.